Matangi Private Island Resort is a horseshoe-shaped island encompassing 240 acres of lush tropical rain forest and secluded white-sand beaches. Designed in a traditional Fijian style with thatched roofs and wood furnishings, this adults-only retreat offers just 14 accommodations. With unspoiled natural beauty, the resort attracts couples and honeymooners seeking privacy and tranquility. All Bures at Matangi Island Resort feature air-conditioning and ceiling fans, 4-poster Sealy king-size beds, private facilities, outdoor lava-rock showers, Pure Fiji bath amenities, bathrobe and slippers, hair dryer, in room electronic safe, I-pod docking station, fully stocked mini bar (additional cost based on usage), fresh baked cookies, French press coffee/tea making facilities, large sitting area, private veranda, beach towels and beach hammock. 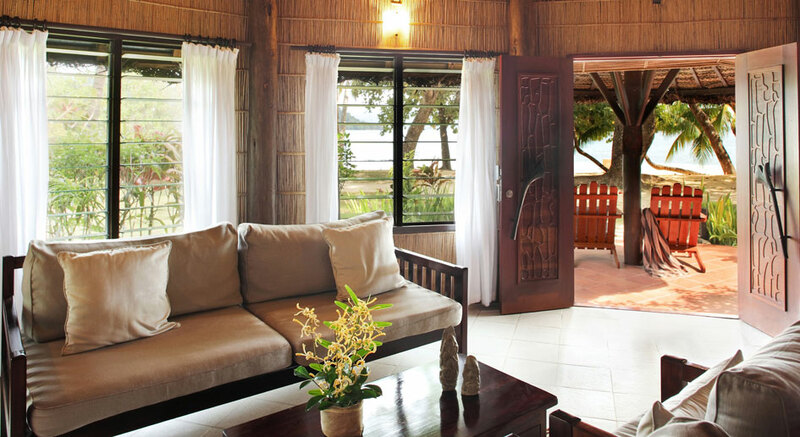 In addition to four Oceanview Bures, there is a two bedroom Bure, five Beachfront Bures and three Treehouses – one of the most amazing accommodations available in Fiji. Rates include all meals, morning and afternoon tea, and most non-motorized water sports. All of our quotations are inclusive of airport transfers as well as Fijian taxes. Celebrate your love at Matangi, a tropical private island paradise that inspires romance; an intimate beach ceremony, with sand beneath your feet, tropical palm fronds overhead, and the crystal blue South Pacific ocean before you! What could be more perfect than your wedding day on a private island in Fiji?. The number of weddings is limited in any given week so that each one is very personal and special. Most non-motorized activities at Qamea Resort and Spa are available at no extra charge. The snorkeling and diving in the area is some of the best in the world. Guests can take advantage of complimentary water sports at the beach including snorkeling, kayaking, and windsurfing. Scuba diving and snorkeling excursions are also available (surcharge). At the spa, guests can enjoy facials, body treatments, and massages such as the Fijian Massage or the Papaya Wrap (surcharge). There are many other activities available for a nominal fee. The Island resort caters to adults only (16 years and older).